While our visitors search the shallow pools, finding anemones, fish, prawns and hermit crabs, Other Half and I walk out through slippery gullies towards the sea with Junior, taking photos and collecting interesting creatures for our visitors to see. 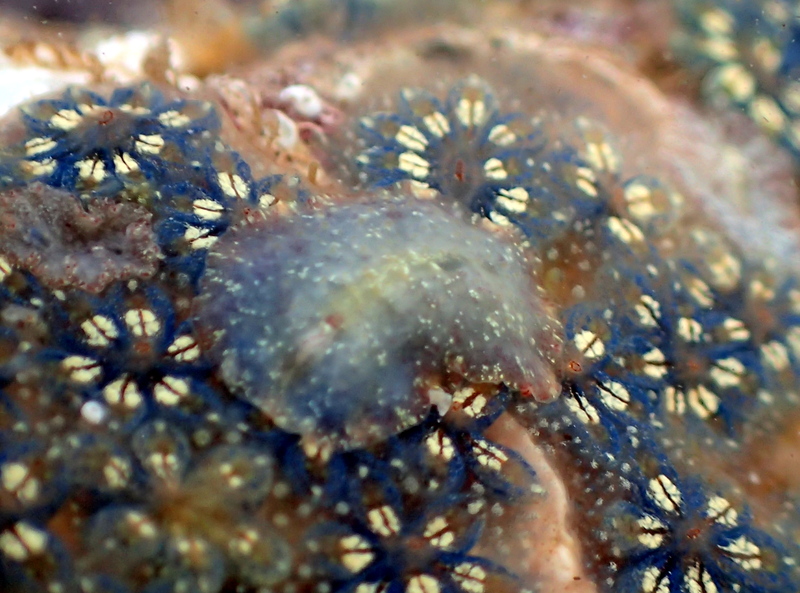 I find a small rock with a beautiful covering of star ascidian. 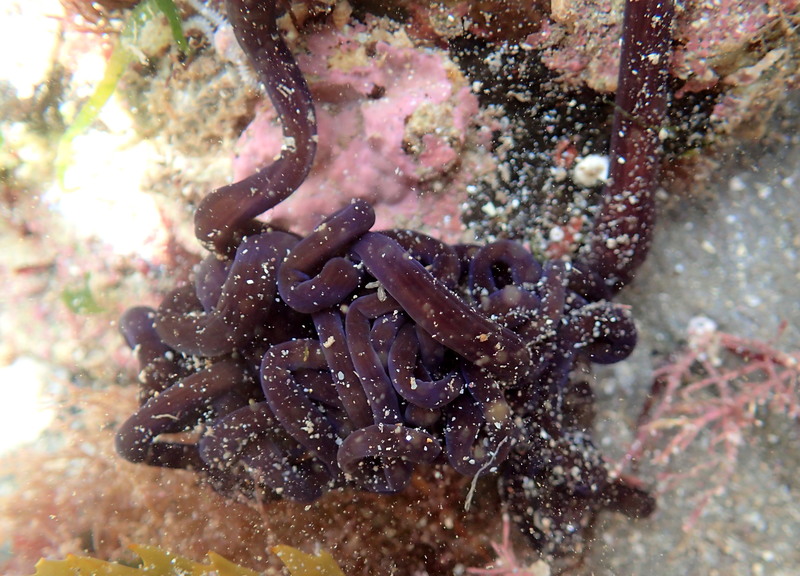 As I look more closely I see flatworms moving across the sea squirts. They seem to be iridescent, flecked with glowing yellow spots. They have head tentacles, like a slug, with eye spots at the end. They’re fascinating creatures but very hard to identify to species level in the field. I film hermit crabs fighting over food in the shape of a flat periwinkle. 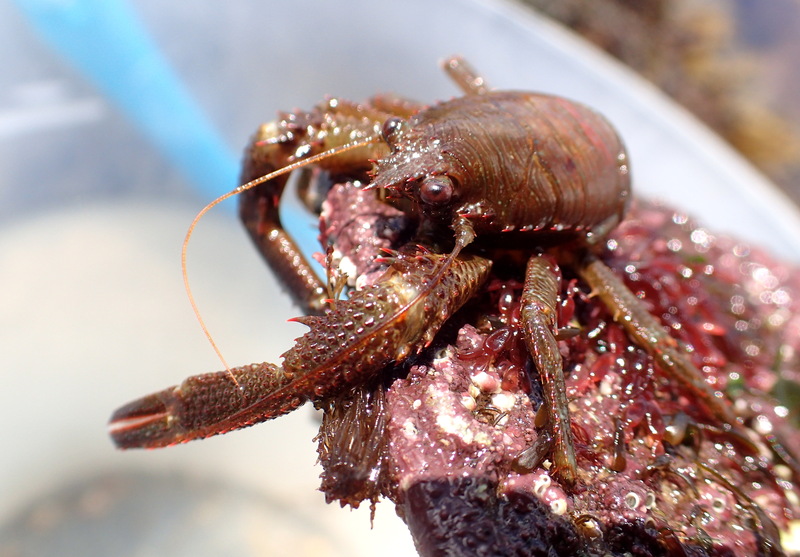 A minuscule shell runs across a rock and I lift it to find a hermit crab with hairy claws (Anapagurus sp.) inside. 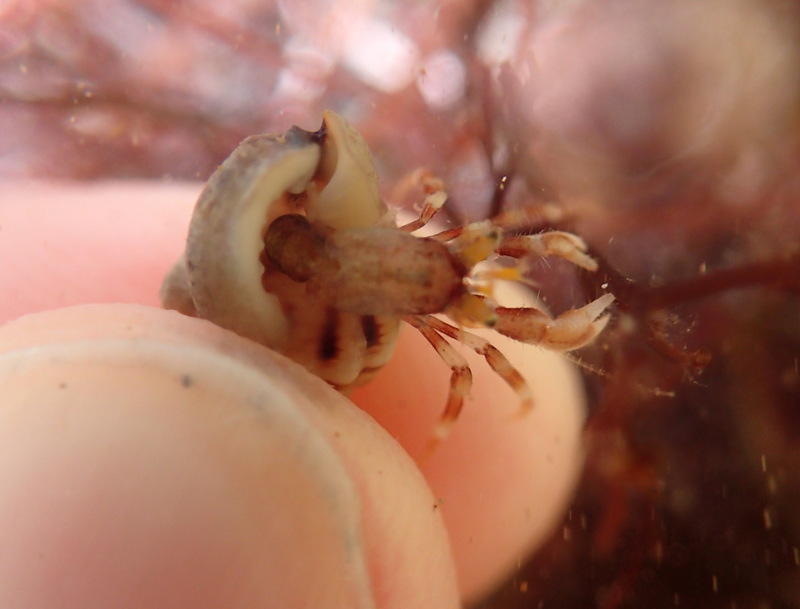 This hermit crab was tiny – compare it to my thumb on the left! 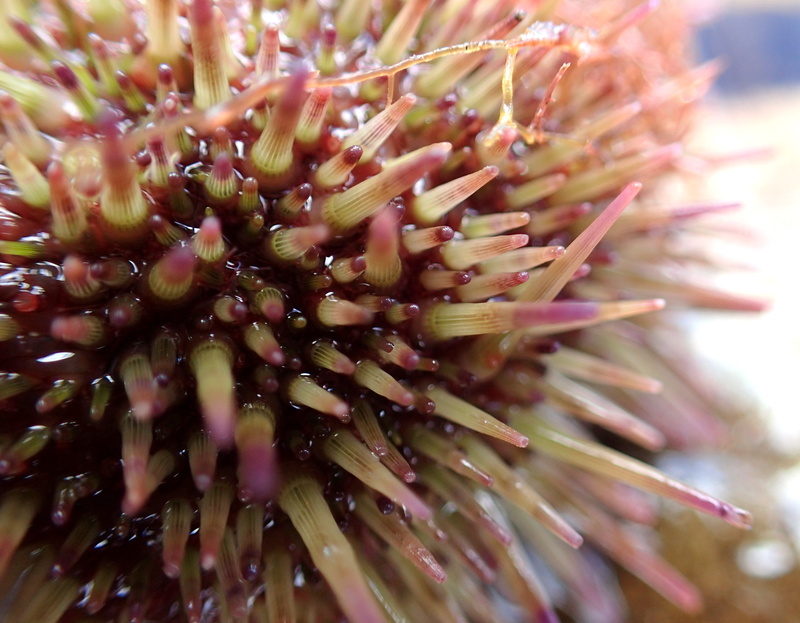 In one area there are many shore urchins. They often seem to cluster together like this. I notice one has its tentacle feet out, reaching in all directions. 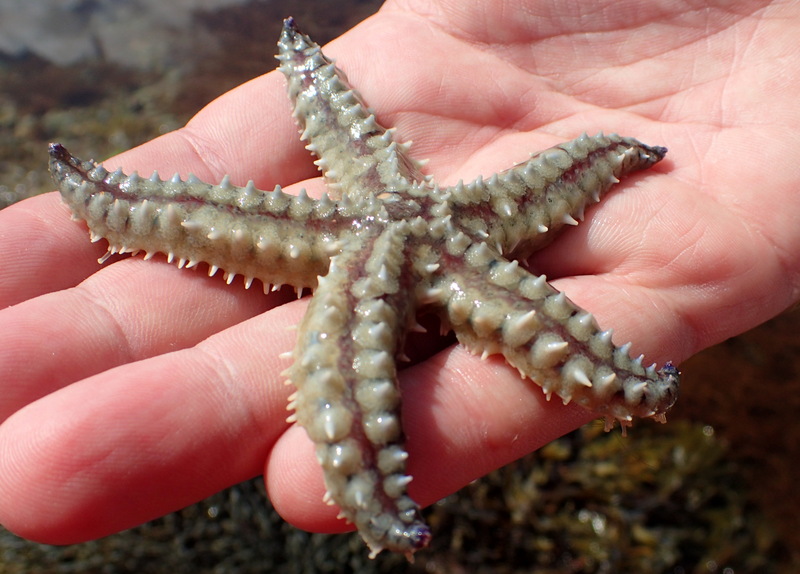 I collect a cushion star to show my friends but keep looking for larger starfish and brittle stars, knowing that this is what they most want to see. Large edible and montagu’s crabs scuttle around my feet, but I ignore them and keep hunting. 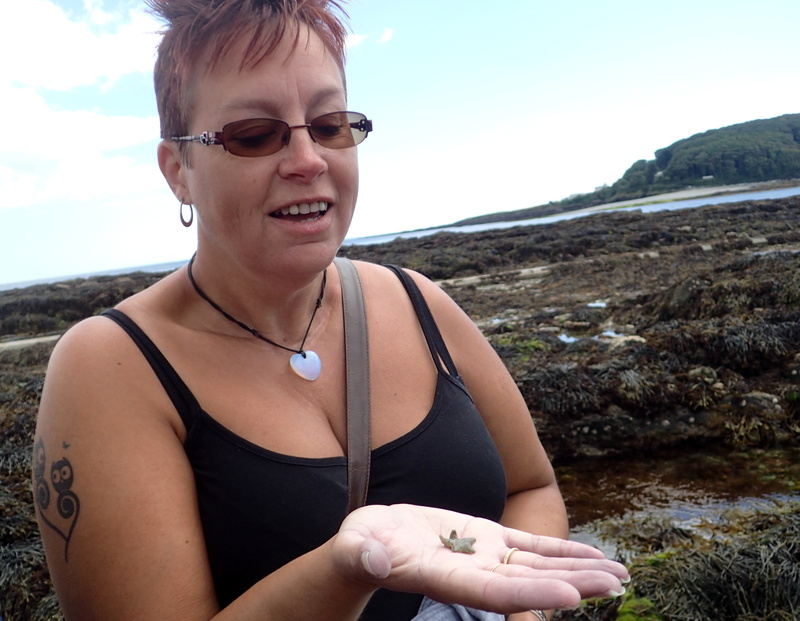 As I lift a piece of bladderwrack, a rockling flaps and thrashes, making me leap out of my skin. It swims away and is gone in a second. As I reach the end of the gully I turn a rock and discover echinoderm heaven. 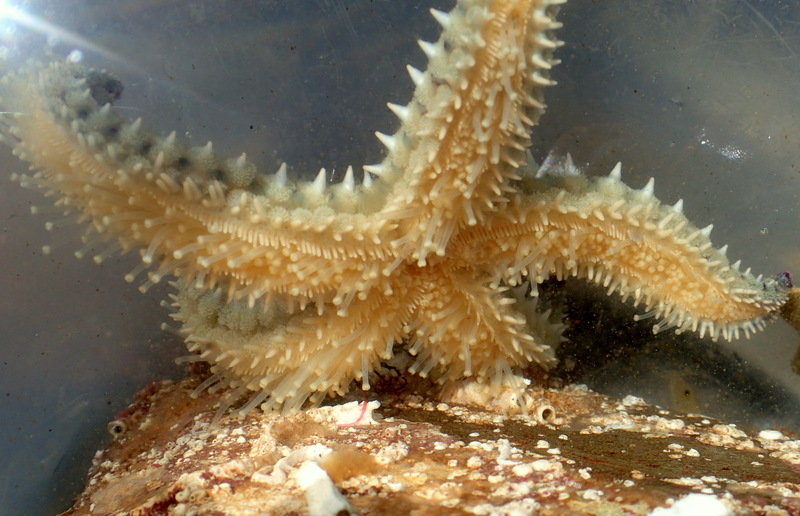 Large brittle stars are walking over the edge of the stone on spindly legs and right in the centre of the rock is a fair-sized spiny starfish. I worry that I’ve left my visitors alone too long and that they’ll be bored, but I find them still completely engrossed in their search for crabs. They take turns to hold the various starfish and we put the spiny star in the bucket to watch it unfurl its hundreds of tentacle feet. Our visitors are delighted with all they’ve found and seen. We’re already planning their next trip. 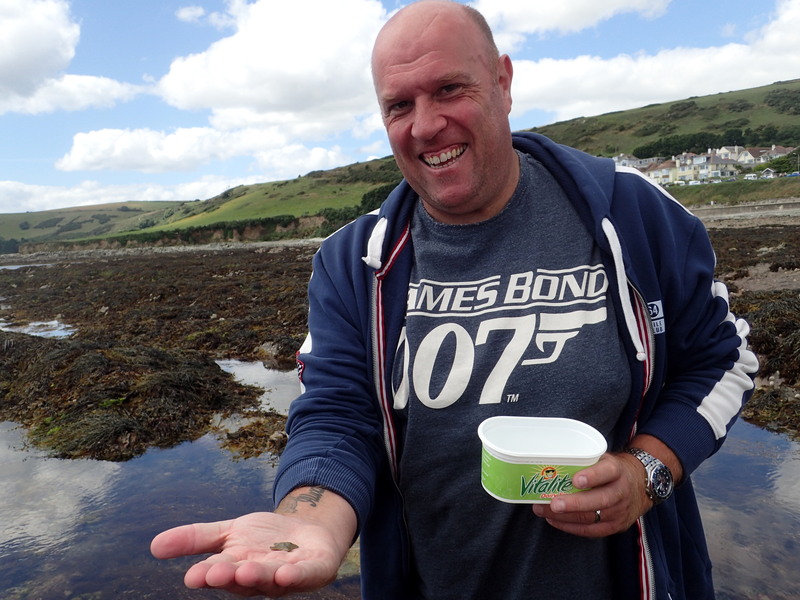 And I’m pleased too, both that my friends have discovered the joy of rockpooling and seen starfish, but also that I found a flatworm I hadn’t seen before. Is it normal to love worms? There are some amazing ones in the Cornish rock pools. Another worm find… a bootlace worm. These worms are many metres long when fully extended, but are usually found in a tangled ball like this. 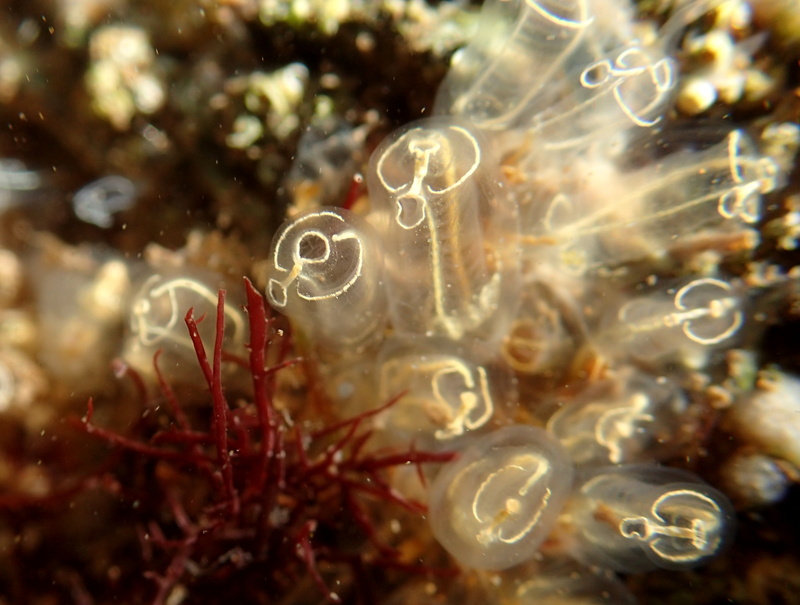 Light bulb sea squirts. One of the jewels of the Cornish rock pools. 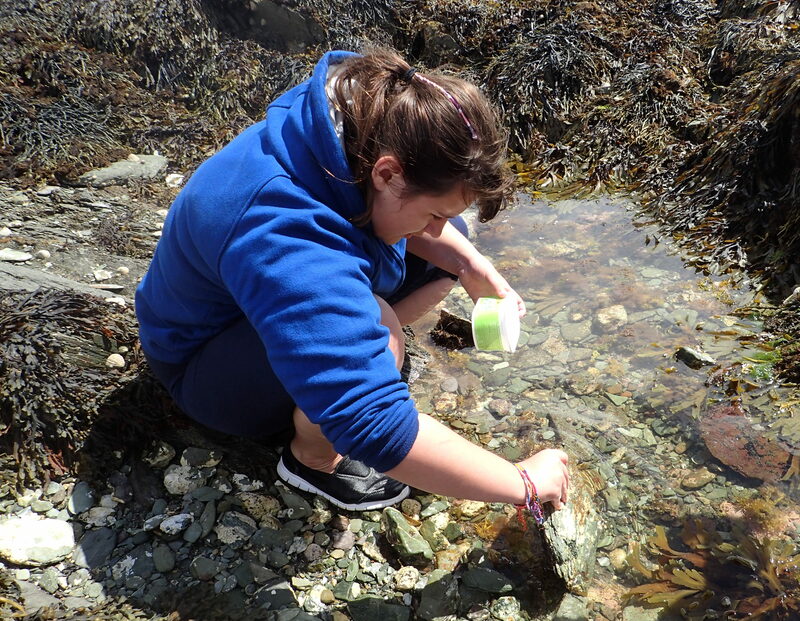 Happiness is rock pooling – and we’re already looking forward to doing it all again next year.